Welcome to Greg McGee Engineering. Products located in USA! Ships fast from Denver, CO USA! Greg McGee Engineering invites you to browse through our extremely high quality, tested in USA, flashlights and shop with confidence. We invite you to create an account with us if you like, or shop as a guest. Either way, your shopping cart will be active until you leave the store. Go to www.gregmcgeeengineering.com to learn more about Greg McGee. 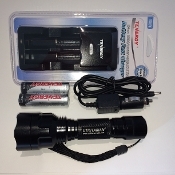 C3-907 Single Mode 170 Lumen AA Flashlight C3-907 Six (6) Mode 170 Lumen AA Flashlight H4-2 MKR Tactical 1600+ Lumen!!! CREE MKR diode, new Design!!! MTE D3-5 Search (Fat Boy) MTE Factory Holster with Battery Pouch MTE H6-1 "Thrower"
Copyright © 2009-2019 Greg McGee Engineering. All rights reserved.